Ohio State basketball fans – this one might hurt just a little bit. Veteran Cavaliers guard Brandon Knight – acquired by Cleveland in a three-team deal at the Deadline – made his bones beating the Buckeyes in 2011 as he willed his Kentucky Wildcats to the Final Four back in 2011. And, with college hoops raging across the nation, Knight tips off Cavs.com’s Tournament Tales this spring. One year after John Wall and DeMarcus Cousins’ 35-3 Kentucky team fizzled out, Knight’s Wildcats were looking to right that wrong and win the school’s first National Championship since 1998 – entering the Tourney as a 4-seed in a bracket that included North Carolina, Syracuse, West Virginia and that year’s No. 1 overall seed, the Ohio State Buckeyes. Led by Knight – one of the top recruits in the nation out of Miami – that year’s Kentucky squad also featured future NBAers like Doron Lamb, Terrance Jones and former Cavalier DeAndre Liggins. Enes Kanter was forced to sit the season because of eligibility issues. That year’s Tournament started ominously for Knight – missing his first seven shots before hitting the game-winner with two seconds left to deny 13th-seeded Princeton a shocking upset. Determined to put that game behind him, Knight dropped 30 points on West Virginia – the team that had eliminated Kentucky the previous season – to advance to the Sweet 16. The Wildcats pulled off an upset of their own in the next round – with Knight drilling the go-ahead mid-range bucket with five seconds remaining to stun Thad Matta’s Buckeyes and reach the Elite 8. Kentucky scored its second straight upset, knocking off Harrison Barnes, Kendall Marshall, John Henson and the 2nd-seeded North Carolina Tarheels in New Jersey. But they ran into a buzzsaw when it came time to face a white-hot Kemba Walker and his UConn Huskies – falling by just a point to the eventual National Champions despite a team-high 17 points from Knight, who departed UK after one season and was tabbed by the Pistons with the No. 8 overall pick less than three months later. Brandon Knight formed a unique bond with John Calipari in his single season at Kentucky. Was there ever a chance you would just stay in-state and play for Florida, FSU or The U? Brandon Knight: I mean, 'The U' is a family favorite. We love The U – especially football. Basketball had some up-and-coming players that were able to make the league as well and it was always a hometown favorite. I obviously didn't end up going there, but we still love the 'Canes. What makes John Calipari so special and what’s his appeal to recruits? Knight: I think it's because, with his players, he's real. For a certain kind of player, especially a top player, that's really all you want – somebody to be real. At 18, a lot of kids don't really know what's real. But I was able to distinguish what was and what wasn't. And that's what led me to choose Kentucky. Was there any pressure following John Wall – the No. 1 overall pick – and that 35-3 team at Kentucky? Knight: I think me watching John at Kentucky from high school, playing against him in high school – because we played each other a lot – actually made me go to Kentucky, to be honest. Because I saw his progression. I saw that he got better. And I love the way his game changed. So there wasn't any pressure. It was more of seeing that John got better and became the No. 1 pick. And I wanted to be in the same mold as that. Whatever was happening at Kentucky, they've got something going on, their players are getting better and they're winning. And I wanted to be a part of it. Something that I had seen were other players around the same age that went to different schools, they didn't make those same leaps that guys from Kentucky did: Eric Bledsoe, DaMarcus Cousins, John Wall -- those guys made incredible leaps from being high school players turning into incredible college freshman. So I was like: Whatever's in the water at Kentucky, I want to drink that water. So watching those guys -- Wall, Cousins, Bledsoe -- actually pushed me to go there, and even if they had stayed, I probably would have still gone there because I wanted to become a better player. "We had some of the top-ranked high school players, so at that point we were thinking, all you need is one game. They might have beat us in a series, but we believed in ourselves that night." Would that team have won it all had Enes Kanter been able to play? Knight: I think we would have won it for sure. We kind of got worn out down the stretch. And if you've got somebody that you can dump it down to in the post as a guard throughout the year, you're going to save so much stress on your legs and knees and joints. You last a little bit longer because you got a guy taking the pressure off of you, getting easier shots. But, yeah, I think if he had played, we'd have won it easy, hands-down. 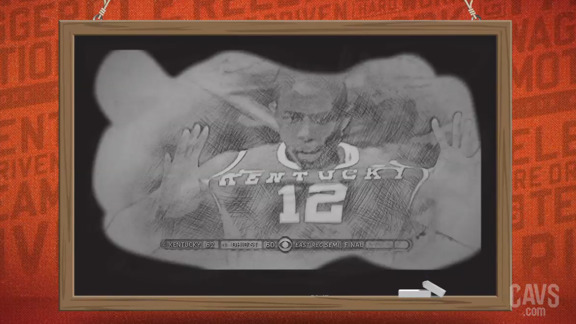 In the Tournament opener, Kentucky (and you personally) struggle against Princeton. What makes them such a difficult matchup? Knight: Well, Princeton is just disciplined. That's probably why they're at Princeton. They just stick to the gameplan and if they change it, then they stick to that change. They run their offense with discipline, they run their defense with discipline. And they have solid players. They played us pretty tough and up to that last little bit. But I finally got a shot to go in -- and it was the right one. How much of it was nerves and how much of it was Princeton’s D? Knight: I wouldn’t say it was them. I mean I think I got some good looks; I just missed. Sometimes that happens in basketball, no matter who you're playing against. They played us tough, but we still came out with the win. How much did that game influence your big outburst against West Virginia? Knight: Well, I had to make a mental note! (laughs) I couldn't just go 1-for-8 -- I still remember that stat line -- 1-for-8. And I was like: I can't go out like this! So against West Virginia, I made a point to try to be aggressive and show myself. And not only that, West Virginia, the year before, had beat UK – DaMarcus, Wall and all those guys in the Elite Eight. So we kind of felt like that is NOT happening this year. What was the mindset going up against top-ranked Ohio State? Knight: Well, Aaron Craft was one of the best defenders growing up that I had played against. And Ohio State was clicking on all cylinders. But as we got closer and closer towards the end of the game, we saw we had a chance of winning. And we always believed we could play with the best of them. We had some of the top-ranked high school players, so at that point we were thinking, all you need is one game. They might have beat us in a series, but we believed in ourselves that night. We got down to the last couple minutes and things could go either way -- it's about who can make those plays. And I made a big shot towards the end. They came back down, had one last look and banked it off the rim. The next thing you know we're running around screaming "UPSET!" Calipari didn’t call timeout on that last play and just let you run it. What was going through your mind? I had already been in a situation in that Tournament where it was just win. No matter how good or bad it looked, it's about winning. I remember making a move where I had a screen coming, and I know Craft was probably going to try to send me to the screen, so I went away from it. He did a good job of cutting me off. But I pulled up and made the shot. Kentucky had just gotten back on the basketball map the previous season and now you’re facing basketball royalty – North Carolina – to reach the Final Four. How much did that factor in? Knight: I don't think the name mattered at all. We came together and we won the SEC. We weren't supposed to win that, apparently. But we won it. And Carolina – we’d played them earlier in the season and they beat us. So, we had that chip on our shoulder as well. We were thinking: They're not beating us again. It's not happening. Do you still break John Henson’s chops about that? I mean, not so much anymore because he and I have been teammates for a while. But we talked about it forever. Matter of fact, we just spoke about it today! Was anyone going to beat that UConn team that season? Knight: We had played UConn earlier in the season too -- in Maui -- and they beat us by 30. They drug us! So we had that chip on our shoulder as well. And we kind of felt like that was actually the National Championship game. No disrespect to the other side, but we felt like whoever won that game had an 80-90 percent chance of winning the whole thing. Our side of the bracket was stacked, and we kind of thought that whoever came out was more likely to win it. It was a tough game, but I think our legs just got tired towards the end of that game. It was a long season and for a lot of guys, being used to playing different types of games in high school, the intensity is much different. Lastly, how much did your performance in the Tourney affect your decision to enter the Draft that June? Knight: It wasn't a set decision. Of course, my goal was to make it to the NBA, but I'm a realistic person. So I had to really look at what was going on – watching draft boards, seeing what the experts were saying, what the NBA guys, scouts and general managers were saying. And after the Tournament. I couldn't go back to school -- a couple game winners, one or two 30-point games in a tournament, making the Final Four. Cal sat me down and talked to me – and this is why I respect Cal --because a lot of coaches at the time weren't embracing the one-and-done thing. And a lot of them were getting guys in rooms and telling them: 'Look, you need to come back, it's good for our program, good for our team' and not really letting the family and the kids make a decision on their own. He said the only way I let you come back is if you tell me you want to get your degree next year or you tell me you want to win a National Championship for sure. He said: 'Other than that, I think you should leave.'. So once he said that, and I'm basically having one of the greatest coaches of all time telling me: 'you're ready and it's just time to go’ and knowing that playing in the league this has been my goal since I was four or five years old, I couldn't say no to him. In the spirit of the NCAA tournament, Brandon Knight recalls his big shot against Ohio State back in the 2011 Big Dance.